The Hyper-V Virtual Machine sensor monitors a virtual machine running on a Microsoft Hyper-V host server via Windows Performance Counters or Windows Management Instrumentation (WMI), as configured in the "Windows Compatibility Options" of the parent device. Note: The parent device for this sensor must be a Hyper-V server or a System Center Virtual Machine Manager (SCVMM). Note: We recommend using System Center Virtual Machine Manager (SCVMM) as parent device, because this way PRTG will continue to monitor your virtual machines also when they change the physical host using Live Migration. Note: To monitor a virtual machine with this sensor, disable User Account Control (UAC) in the control panel of the Windows operating system which is running on this virtual machine. Otherwise, the sensor might switch into a Down status with the error message "The virtual machine is not running or is powered off". 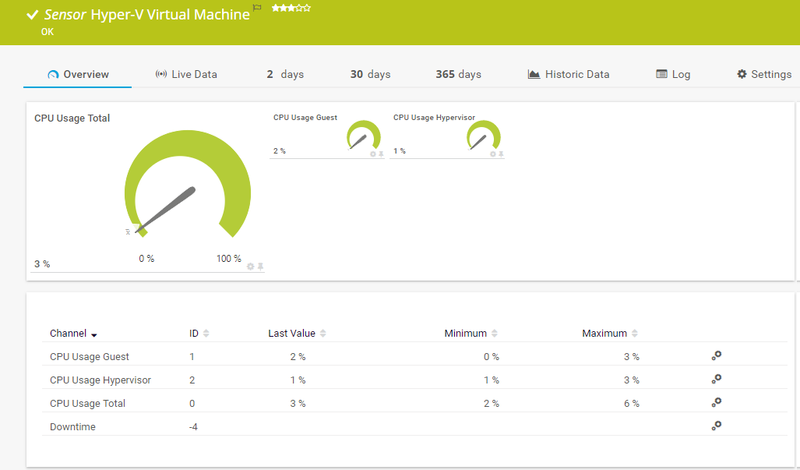 Select the virtual machines you want to monitor. PRTG creates one sensor for each VM you choose in the Add Sensor dialog. The settings you choose in this dialog are valid for all of the sensors that are created. Select the virtual machines (VMs) you want to add a sensor for, including the ones that are not running. You see a list with the names of all items which are available to monitor. Select the desired items by adding check marks in front of the respective lines. PRTG creates one sensor for each selection. You can also select and deselect all items by using the check box in the table head. Note: Ensure the name of your VMs do not contain unsupported characters, especially avoid the hash ('#') sign. We recommend to not rename virtual machines once you have set up monitoring. For detailed information, please see More section below. Alarm when powered off: The sensor will change to a Down status if the virtual machine is powered off. Note: While in Down status, a sensor does not record any data in all of its channels.